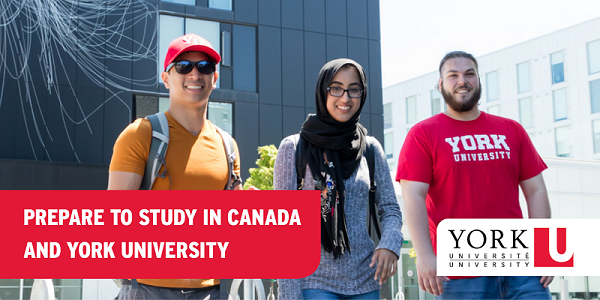 Prepare to Study in Canada and York University - StudyinCanada.com! As an international student, there are many things you need to plan before you make your way to York University: preparing documents, making accommodation arrangements and thinking through money matters. York University has all the resources you need, including York International. York InternationaI can help and support you with many of your questions before and after arriving at York and will be your home away from home while you are here. If you are just starting the process of studying abroad, or are interested in studying at York University in the future, this article will help you get ahead and prepare for what’s to come. The first thing that you want to have ready are your documents. Your passport must be valid, you must have a student visa and a letter from the Government of Canada inviting you to attend York University. These documents make it possible for you to receive your student permit. If you are missing any of these documents, it could delay your arrival in Toronto, Canada and you could miss the start of classes. Do not leave these tasks to the last minute! To find a useful list of resources and documents to support your process, visit York International’s Immigration Information website. As soon as you have your documents set to go, we recommend that you begin to think about arranging for your accommodation. If you plan to live on campus, you can apply for residence prior to the June 1 deadline through ousing ServicesH. All first-year students are guaranteed a spot in one of the eight residences on campus. If you prefer to live off campus on your own, you have the option to look for housing near campus and pre-arrange a rental before you arrive. As an international student, you may be eligible to work in Canada while studying and after you graduate. Obtaining a job while studying has many benefits and we’re here to help! York University provides job postings through their Career Centre, giving you the opportunity to work on- and off-campus. York International also facilitates opportunities for international students interested in co-operative education and networking opportunities. To learn more about employment opportunities and co-operative education at York University, visit York International’s Working in Canada website. Finally, take advantage of York University’s social media channels and ask any questions that could help you through this process. You can reach us on Facebook or Twitter, as well as read our Division of Students blog, YUBlog, for further guidance.